BBQ or Barbecue is a genre of food that is considered All-American. Historically this is true as the Indigenous people showed the first Europeans how to barbecue as far back as the 1500s. These days we BBQ for holidays, special events, for the game, or spur of the moment if the weather is nice. Across the nation, we Americans do not need an excuse to break out the grill. For those of us who are not that good at it or desire BBQ year round, Cleveland has many places that can give you a tasty bone or brisket. That being said, some places are good while others are elite. 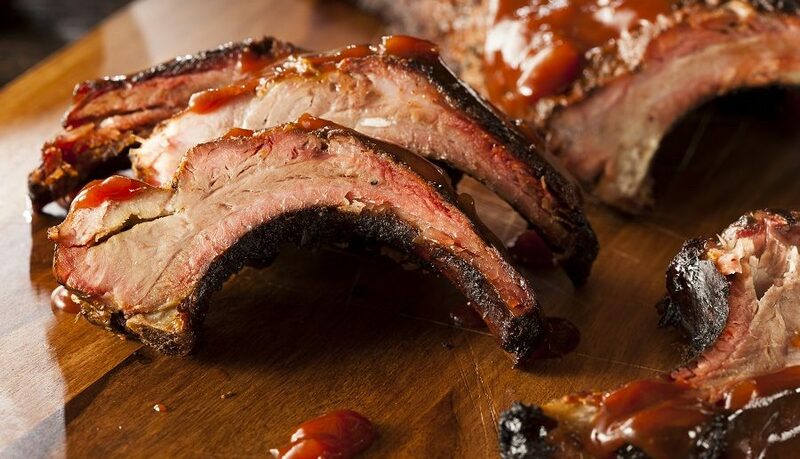 The Cleveland Leader has gone all over town seeking out the finest BBQ spots and after a lot of indigestion, cole slaw and white bread, we have successfully assembled our list of the best BBQ spots in Cleveland. Many of these places have been around before myself and a lot of our fans been alive. Some 50 years and up. In the restaurant business, 50 years is an eternity and many on this list were inspired by the legends. Others are relatively new but like anything else, if you are great at what you do, you should be recognized for it regardless of tenure. By far this was one of the hardest yet rewarding tasks thus far. If we missed your favorite place, please let us know and we will check it out. Maybe next year it will make the cut. Home of the “Polish Boy”, Whitmore’s has been feeding families in Cleveland for generations. In addition to creating this iconic sandwich, Whitmore’s BBQ has a full menu that includes corned beef sandwiches and fish dinners. One of the forefathers of Cleveland BBQ, Whitmore’s has a rich tradition in the city for food excellence. With 3 locations, Whitmore’s is sure to please. One of many Award-winning establishments in Cleveland Heights, this family owned and operated restaurant has some of the best BBQ anywhere. With its focus on serving non-GMO meats, the Rib Cage has grown into a formidable entity in BBQ in the Cleveland area. This is a major accomplishment due to the rich history of superior BBQ restaurants in town. In addition your favorites, The Rib Cage has Turkey Ribs, Grilled Gulf Shrimp and an impressive Craft Beer and wine list. Celebrating 60 years in the restaurant business, Beckham’s B&M has been one of several family owned BBQ empires in Cleveland. The Beckham family has been one of the most charitable and they have been one of many business owners who have consistently given back to the community over the years. In addition to four locations the B&M Truck is all over town so be sure to grab a slab, a chicken or shoulder dinner or two on the way home. If you grew up in Shaker Heights or in the Lee-Harvard Area then you are familiar with Hot Sauce Williams. Many of my friends remember going to grab chicken wings for $0.25 each on the way home from school. Hot Sauce Williams has been a late night savior in Cleveland for over 50 years. In addition to the chicken wings, the ribs and fish dinners are clutch especially after a weekend of revelry with your friends or a night home with the family. One of the westside’s top BBQ spots, Brooklyn BBQ is the go-to place for many families. The Pulled Pork Sandwiches, Rib Tip Dinners in addition to half and full slabs and Polish Boys AND girls and an arsenal of sides has me contemplating hopping on I480 West again for some more. One of the eastside’s most popular BBQ spot, Open Pit has been a fixture on St. Clair for many moons. People are driving from the westside for their Polish Boys and Lake County for their ribs. 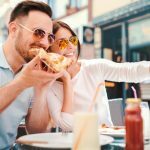 Others drive from an hour away or more for their food per food reviews and testimonials on Facebook. Most people are using Uber eats for Happy Meals so if folks are using up precious fuel to eat somewhere, my guess is that the food is spectacular(which it is). My personal favorites are the Rib Tips, Polish Boys and Fish Dinners. Committed to real smoked BBQ, Ohio City is serious about BBQ supremacy in Cleveland and beyond. This is due to their partnership with The Blazin’ Bronco BQ Company, which has won several Rib Cook Off titles and their insistence on using only the best food and working with best people. The Beef Brisket, Ribs and the Cleveland Platter will certainly make your doctor highly upset. Celebrity Chef Michael Symon has pulled off many successful restaurants that are diverse in their cuisines. Mabel’s BBQ is his interpretation of BBQ Cleveland style. 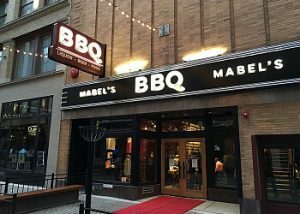 Using meats that are free of chemicals and hormones and being one of the few places that sells Lamb Ribs (which are FREAKING AWESOME), Mabel’s BBQ is bar-b-cue but upscale with an extensive bourbon list and swank atmosphere. Fellas, if you want to take your lady to a nice place but eat stuff you like, this is a win-win scenario and if she is from Cleveland she probably recommended Mabel’s to you (Marry her if she did!). Voted Best New Restaurant of the Year, Boney Fingers is a newcomer to the BBQ scene in Cleveland. That being said, the crew there seem to be doing a lot of things right such as cooking their meats for at least 16 hours a day and making all of their food fresh. The Brisket, Ribs, The CLE, Pork Belly Tacos and Pulled Pork have contributed to their early success. 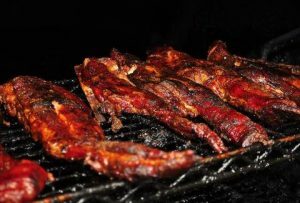 One of Euclid’s hottest BBQ spots, R Ribs has a full menu that is dedicated to BBQ and all of your soul food favorites. Some include BBQ Pork Shoulder Sandwiches, Fried Whole Chicken Dinners, Polish Boys, Rib Sandwiches and an array of fish dinners. Traditional sides like Macaroni and Cheese, Potato Salad and Baked Beans are available. For over 30 Years, Kym’s Wings has been a Cleveland staple for BBQ and Soul Food. Its new location in Willoughby has quickly turned heads and more people in Lake County, Ohio are learning what us Clevelanders have known for a while…Kym’s wings and BBQ are phenomenal. In addition to the wings, Kym’s has Full and Half Slab of Ribs, Rib Tips and Shoulder Dinners and a full Soul Food Menu that has seafood, burgers and an extensive list of side dishes. If you are into variety when it comes to your BBQ then Smokin Q’s should be chiseled on yur bucket list. In addition briskets, slabs and half slabs of ribs, Smokin’ Q’s has a Southwest and Mexican spin on BBQ with tacos, nachos, quesadillas and other traditional dishes made with the smoked meats. They also have juicy burgers and the side dishes are sublime. I recommend the Heriloom Lentil Burger, The Fat Heifer and The Hot Chic as sandwich/burger selections especially. A part of the Hot Sauce Williams Family, Hot Sauce Legacy expands on the sturdy foundation of the famed Soul Food Restaurant chain Hot Sauce Williams BBQ. With all of your favorites such as the ribs, chicken, polish boys and shoulder dinners, The Legacy of Hot Sauce Williams seems to be in great shape. Another Cleveland BBQ icon, Mt Pleasant BBQ has been around for over 50 years serving the Mt Pleasant community. Many fans come from all over town to get the full and half slabs. You even have fans ordering slabs of ribs fresh off their flights from Cleveland-Hopkins Airport. This is a very small sampling of a multitude of customer testimonials that are a reflection of the quality of the food Mt Pleasant has been serving up for generations.